An often-overlooked part of the American policy-making process involves researchers, academicians and others who gather and analyze data about the effects of certain public policies on various demographics, or on the problems that public policies can address. The erudition these researchers provide can be vital in informing public policy and the decisions of lawmakers. But yet, research shows that there is often a disconnect between research and rule, according to Dr. Karen Bogenschneider, director of the Policy Institute for Family Impact Seminars, who spoke at BYU’s Civic Engagement recent research conference. “The story of U.S. social policy reveals a disturbing disconnect between the research community, what we call knowledge producers,” said Dr. Bogenschneider, “and the policymaking community, what we term knowledge consumers. Although the quantity of research has expanded dramatically in recent decades, its role in shaping policy decisions seldom matches the level warranted by the magnitude of the investment in science by government and the philanthropic communities, among others.” Her research on the topic was consolidated into a book published in 2010; it is currently in its third edition. It was from this book that she pulled the data she discussed at the conference. 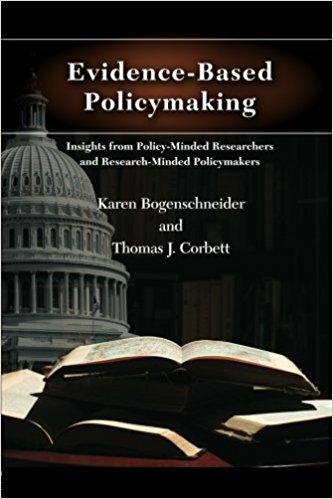 Coauthored with former Associate Director of the Institute for Research on poverty Thomas Corbett, the book details how to integrate research with policymaking. In a panel discussion featuring Dr. Bogenschneider and School of Family Life professors Chelom Leavitt and Alan Hawkins, the trio discussed their experiences with bringing their research to legislators. Dr. Hawkins related that in the beginning, he thought if he simply brought his scholarship to policymakers, they would automatically utilize it in lawmaking. He quickly realized that this was not the case, that a connection needed to be established first. “It’s like match.com, nobody wants to make the first step,” said Dr. Bogenschneider. Seek out the lawmaker’s staff and share your research with them. Hook yourself to a star who will get you there; find someone with an “in” and utilize their connections. It’s more than relationships—it’s getting the right legislator. You may have a stellar relationship with a certain lawmaker, but if they’re not doing anything, find someone who is. You want a mover and shaker. Dr. Bogenschneider has raised almost $3 million to support her research and outreach, according to Purdue University’s Family Impact Institute. She is a Rothermel Bascom Professor of Human Ecology at the University of Wisconsin-Madison and a Family Policy Specialist at University of Wisconsin-Extension. She has served as director of the Wisconsin Family Impact Seminars since 1993 and as Executive Director of the Policy Institute for Family Impact Seminars since 1999. In 2010, she received the Extension Lifetime Achievement Award for Outstanding Contributions by an Extension Specialist from the National Family Life and Children State Extension Specialists. In 2008, she received the Engagement Award from the Board of Human Sciences of the National Association of State Universities and Land Grant Colleges and, in 2006, she was named a fellow of the National Council on Family Relations. She has also received several awards from her university for faculty excellence, land grant scholarship, and quality outreach.